CARES is the solution to safe and easy flying with children! 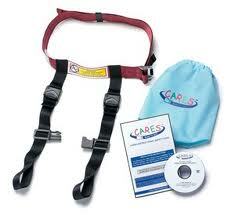 CARES, the Child Aviation Restraint System, is the only harness type child aviation safety restraint ever certified for aeroplane travel by the Federal Aviation Administration (FAA). CARES is an elegantly designed belt and buckle device for kids 22-44 pounds that is easy to use and creates a safe aeroplane seat for your child without the hassle of carrying a 20 pound car seat. CARES weighs just 1 pound and fits into a 6" stuff sack! It is simple to install, adjustable to virtually any size aeroplane seat, and keeps your child as safe as a car seat would. CARES is made of the same industrial-strength webbing as your own seat belt. 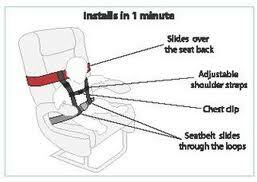 It is engineered and manufactured by AmSafe Aviation, the world's foremost manufacturer of airline seat belts. Need your car seat at the end of the trip? Check it as luggage -- take CARES on board in your pocket for a safe aeroplane seat for your child and a hassle free trip for you! CARES from Kids Fly Safe which is an American company have just released this CARES Flying Safety Harness in the UK and is now available from Mother Care for £79.99. I'm happy to spread the word about any safety products that could protect our children's lives. I was kindly sent a CARES harness for the purpose of this review but as I'm not flying anytime soon with my children I though I should offer it as a prize for you of you, my lovely followers. It would be a sin to let it go to waste. Follow My Blog through Google Friends Connect using the " Follow This Site " button over on the right hand side of my blog and leave me a comment with the best way to contact you if you win. For an Extra Entry you can tweet the following " I want to #win a CARES Flying Safety Harness with @v82chris because I care http://bit.ly/x8tDqP "
Please leave a separate comment if you do the extra entry so that it's counted. This competition will close on Sunday April Sunday April 8th. i m just looking for the blogs... i found it here.. thnx for sharing. My family lives in Brazil and my husband's family lives in Cyprus, so we fly quite often to visit our families. I've never heard about this product before, but it looks great and very useful if you have little ones. Pig Goes Pop - Check out My review & #win 1 too! Save With Tesco & #Win a £50 Voucher To Spend! A Parenting Dilema - Am I over reacting? I've Blogged - Chablis wines! Lily has a new pet - A Pillow Pet. Winners of My Tesco Baby Wipes Competition! How did you celebrate World Book Day?